Enable quotas on the drive where the services will be created. The configuration shown in the screenshot is recommended. Configure the game with Run As = User per Service. Go to Settings > Games > select the game > Select the "Run As" tab. Set Run As = User per service and save. This will create one Windows/Linux user for each service. The disk quota will be created for this user. If you have existing services of this type go to Settings > Game Tools and run the Verify/Repair tool on your server with "Update run as user" checked. Description: Specify the disk quota in MB. Set to 0 for unlimited space. Configure the scripts. Go back to the game's main settings. Click on the Custom Scripts icon. Create the following scripts. Create a new game server. Select the game server, click on the actions tab. Click on Set Disk Quota. Enter the quota and execute. A popup window should say it was executed successfully. 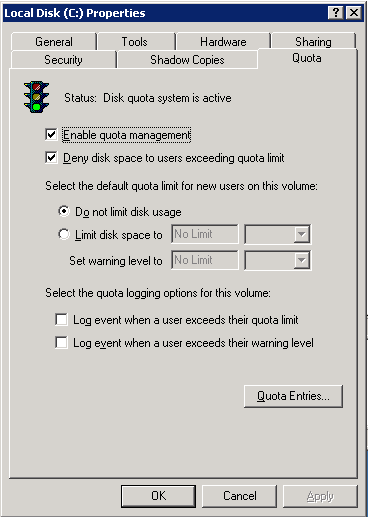 Select "Check Disk Quota". It should show the quota that you created and the current usage. This page was last modified on 19 March 2015, at 22:01.